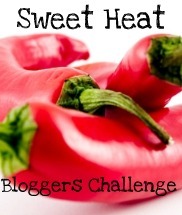 Last night, I commented on Lyndsey's blog, Vanilla Clouds and Lemon Drops, that I wasn't sure whether I would have time to take part in her Sweet Heat challenge. And here I am with my entry for the challenge! The deciding factor was the pineapple which I had bought two weeks ago as part of a buy one, get one free offer. We ate the first pineapple, but I was away last weekend and the second pineapple just sat there looking more and more dodgy. When I cut the skin off there were actually only a few brown bits which I cut off, but I didn't fancy eating it raw, so in a flash of inspiration I decided that I could adapt the Tomato and Chilli Jam recipe I made in September to make Pineapple and Chilli Jam. Chop half the pineapple into small pieces and set aside. Put the rest of the pineapple with the chillies and their seeds, garlic, ginger and fish sauce in a blender and blitz to a fine puree. Spoon the puree into a deep, heavy-bottomed pan and add the sugar and wine vinegar. Bring to the boil slowly, stirring as you go. When it comes to the boil, turn down to a simmer and add the diced pineapple. Skim off any foam that rises to the surface and cook gently for up to 1 hour, stirring from time to time, to prevent the mixture catching and burning. Scrape the sides of the pot too so that everything cooks evenly. The mixture thickens as it cooks. When the mixture seems thick to the stir of a wooden spoon, decant it into a warm sterilised jar and seal. Store in a larder or cool place, not in the fridge, for up to 9 months. Once opened keep in fridge. I had a little taste and I have to say, it was really good even without any time to mature. You could feel the heat of the chilli coming through the sweetness of the pineapple and the piquancy of the vinegar and fish sauce. I'm not sure what that fish sauce does exactly but it is definitely a must for chutneys and relishes. 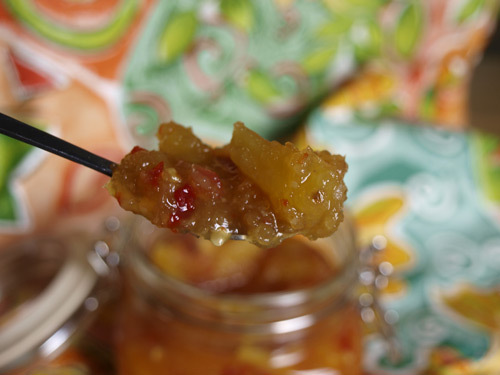 MMMMMMMM,...Your pineapple & chili jam looks divine! yum! Ooooh, sounds really good. There seem to be lots of chutney recipes appearing at the moment and this looks excellent! Oh oh oh! Yes please!!! This kind of sweet and hot it my absolute favourite! Interesting. What will you use it with? That looks great Janice. 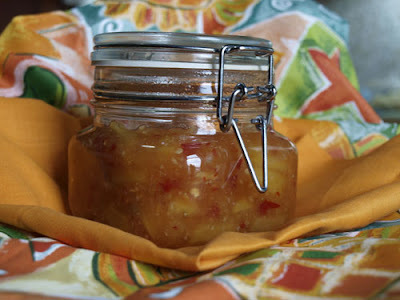 I am just getting geared up for chutney making myself. Will have to remember this one. No fish sauce for me though! 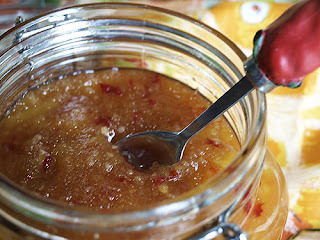 BEAUTIFUL photos Janice and a wonderful looking recipe too, I am a preserves nut,as you know, so I am bookmarking this and may make it next week! Now that sounds really good, perhaps even better than the tomato one. I've been so busy recently making cakes, I haven't had time for preserving, but this one strongly appeals. Now that sounds seriously good! What a unique combination of flavors. I would love to try this! Great idea Janice! Will you serve it with seafood or layer it thick on toast? Thanks for all the lovely comments. I haven't eaten it with anything yet, but I am thinking it may just be perfect to eat with cold baked ham at Christmas time -what do you think? How much approximately do you think this recipe makes? I might give it a try! for Hungryhinny: One large pineapple made that large jar of chutney, probably about the equivalent of two normal honey jars. The Great British Bake Off - Farmersgirl Bakes! Want to star in a Jamie Oliver TV show? Chocolate - all the way from New Zealand!